It’s increasingly commonplace these days for individuals to do their own taxes with the help of tax software — and this year we’re likely to witness the same. In part, it’s the prospect of completing your tax return so much faster that has made e-filing so attractive. And then there’s the cost savings — software has made it easy enough for most people to complete their tax returns successfully, avoiding having to spend money getting a professional to do the job. Many Canadians are using UFile software from Dr. Tax Software Inc. This company has been around since 1987, and sells software to professional tax and accounting firms too. For $15.95 an individual ($24.95 for a family) can use the online version of the software to file their taxes. Sometimes UFile will let you do your taxes for free. It offers this option to families with an income of under $20,000, and also to students. A visit to the Web site (ufile.ca) proclaims you can “complete your tax return in minutes”, which seems a bit dubious. But there are also a lot of reassurances about the security of the site. Within a few clicks and registration pages, you’ll be ready to start crunching the numbers. Get out the plastic visor, refill your cup of coffee, and load your electric calculator with a clean spool of thermal paper. It’s time to crunch the numbers. UFile’s online system is much like the desktop software version. It guides the user along using a simple interface that involves five main sections divided into tabs along the top, a navigation column on the left-hand side, and a text and information input main window. Users either move forward or backwards by clicking “Next” and “Previous” buttons, or jump around via the navigation pane. The software’s design is nothing to write home about. Clicking through the expanding tree menu items and the focus on text makes it feel like you’re using software made during the ’90s. But the program doesn’t need to be flashy to get the job done, and the design is clean and easy to navigate. The UFile interview process collects all your relevant tax information by asking straight-forward questions. Each page has a series of questions or prompts followed by data entry fields. It is like filling out the most complicated and invasive online account form ever. Once you answer basic questions about your tax situation, UFile dives into greater detail and you fill out line after line of information. The process of collecting an exhaustive amount of information is broken down well in this way. 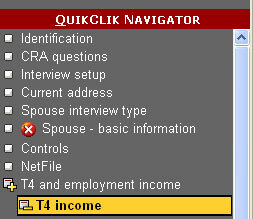 Each line is labeled with a descriptor of the information required, a red number showing you where to refer on your tax forms, and a question mark icon you can click for help. The help button pops up a separate window to explain what the information is, and whether you need to put it in or not. UFile allows you to skip certain screens of the interview process. This is handy if you are waiting on certain forms to come in still, and the program will mark a large red X beside each page that you must complete before finishing your return. The process is very thorough and offers options for almost any tax scenario imaginable. There is a place to input every type of tax form you have into the program. Sole proprietors and small business owners will appreciate the “Self-employment income” phase of the interview. Here, you can break down all of your income and expenses into very specific areas and UFile’s help options answer questions about what amounts you can claim for an item that is partly used for personal, and partly used for business. At the end of the lengthy interview process, a results page displays your tax return like a prize you’ve won at the end of a game. The results page also lists all of the automatic “optimizations” that UFile has performed to get you the biggest refund possible. You’ll want to double-check and ensure that you actually meet the criteria for these optimizations. UFile will explain that to you, as well. Most users will be able to use the NETFILE feature to electronically file with the government. Those who don’t qualify can simply print their form and mail it in the old fashioned way. UFile’s claim that you’ll be ready to file your return in minutes is a bit far fetched. You’ll want to dedicate a few hours to make sure you’ve done a thorough job of this, but there’s no doubt the software is a huge time-saver for those willing to do their own number crunching. Organize all relevant documents, such as T4 and T5 slips, before you begin the interview process. You want to have those numbers on the desk in front of you, and not go digging through a file cabinet drawer every time you need to fill out a field. Remember that just because UFile lets you do something, doesn’t necessarily mean that its legal. The program has some good basic rules to keep you with certain constraints and ensure you fill out all the relevant information. But it has no way of knowing that what you’re inputting is accurate. Use the search feature to find the areas to input unusual forms you might have. Just type in “T###” and the program will provide you links to the right page and instructions on how to enter the information. If you’re filing online, print off a copy for your own records.